A Shropshire office supplies firm has teamed up with a leading county fitness club to encourage employees to be happy and healthy in 2019. Chrisbeon has signed up to be a club sponsor for the Shrewsbury Club, a venue which provides a wide range of facilities and programmes for it’s growing membership. Richard Hughes, of Chrisbeon, said offices across the country are now adapting to allow their employees not only to be comfortable and happy, but to improve their health and fitness at the same time. He said: “We have seen the culture of offices change and it is something that we very much support. 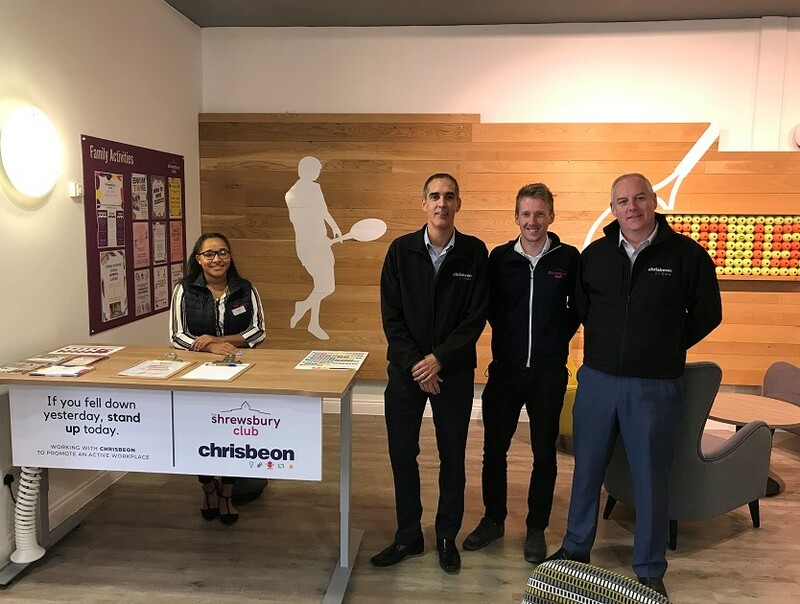 As part of the sponsorship Chrisbeon have provided the Shrewsbury Club, based in Sundorne Road, with a standing desk for their new children’s activities co-ordinator Aimee Anderson. “Aimee’s role at the club is to make sure there is always some family fun happening and children’s activities for the younger members to enjoy,” said the Club’s Marketing Manager, Jon Gidney. “Aimee is based in our Hub area so that children and parents can speak to her whenever they wish. A standing desk is great as she can be there when the members need her but does not spend all day sitting down. To mark the partnership chrisbeon will be giving away two day passes for the Shrewsbury Club to customers buying standing desks between January and April 2019. Pictured above: Aimee Anderson with Richard and Craig Hughes, of Chrisbeon and Jon Gidney, of the Shrewsbury Club.